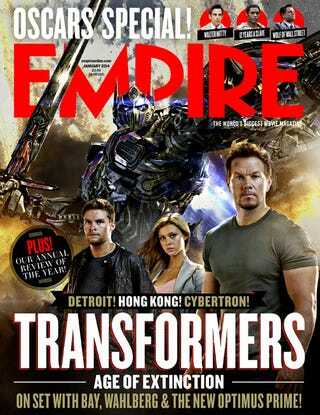 Mark Wahlberg, the white guy in the obligatory Transformer's lead leather jacket, some sort of fashion model and Optimus Prime join together on the cover of Empire Magazine's latest issue. What does a giant alien robot with awesome strength need with a sword? Your guess is as good as mine. This will be Michael Bay's final Transformers film, before passing the seizure-inducing baton off to another director. No word on whether we're getting robot balls this time. Transformers: Age of Extinction will be released on June 27th, 2014.